Dunlop's ROADSMART III has been developed to offer class leading mileage combined with high grip levels in both wet and dry conditions. 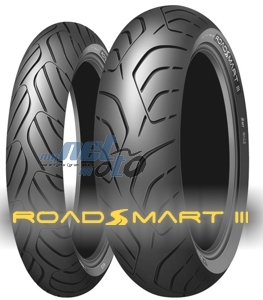 The Roadsmart 3 offers improved rider feed back, comfort and high soeed satbility. There’s a standard Roadsmart III, with a two-ply rear construction, for heavier machines, like big sports tourers and adventure bikes. Rear MT (multi tread) compound uses n newly developed abrasion resistant compound for class leading high mileage in the center with improved compound on the shoulder for superior wet and dry gip. New compound dffers higher grip levels at low temperatures and in wet conditions. 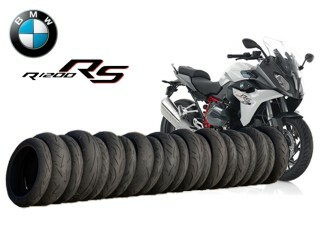 Both front and rear tyres use HES-JLB for improved impact absorbtion ans stability. Slim High Bead Apex for sidewall strength with improved flexibility for superior comfort and less fatigue on long rides. New profile & construction for easy line change and less rider fatigue. Fast warm up. Linear wear and responsive handling throughout tread live.